These four games came in a care package from my friend, whom I had recently given my copy of Master Chu and the Drunkard Hu a few weeks prior. This particular friend, Dano, also happened to play an important role in my decision to go after a complete NES set and the first person I had ever conducted a trade with. Dano is a totally rad friend and a really talented artist. If you’re into awesome, retro-themed t-shirts, coffee mugs, prints and pillows, check out his store right here. The package included: Star Force, Bases Loaded, Tiger-Heli and Iron Tank. These games are all common, but ones that I needed nonetheless. Tiger-Heli is a really cool scrolling shooter and a prequel to Twin Cobra. Bases Loaded is one of four in the series for the NES and the first in my collection; I definitely intend to find all of these quickly in the near future to get them out of the way. Star Force is another shoot ’em up arcade game that’s been ported several times. Iron Tank is n SNK-developed game that’s frequently compared to the earlier game “Guerilla War,” which was also produced by SNK. 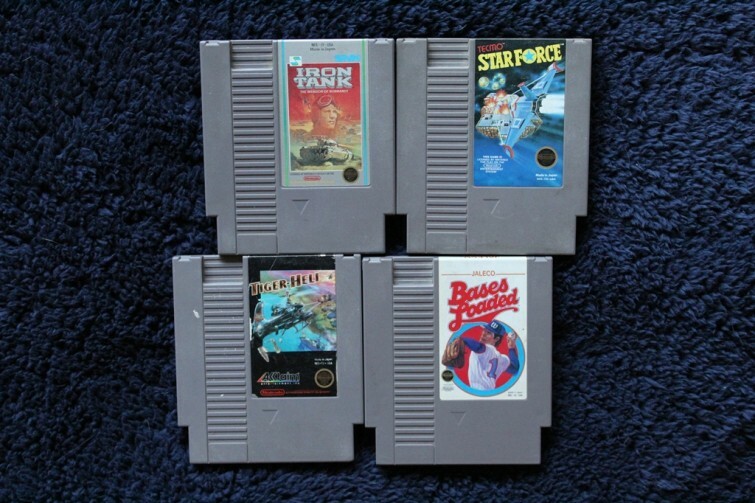 In addition to developing new collecting strategies for pursuing a complete NES collection, one of my favorite parts of NES collecting is playing all these games that I had seen but never had the chance to play. Before now, I hadn’t realized how many quality arcade shooters there were for this platform. This haul brings my collection from 138 to 142 loose NES games. For the rest of the entries of NES Quest, check them out right here on Retro Chronicle.